State of Origin is always an exciting time of the year – particularly for many of our clients, whose patrons will often be watching or discussing the sporting event over some cold drinks. This classic clash of states brings people together as much as it sparks decades-old rivalries, and it’s easy for clubs, pubs, cafés and other venues to get into the sporting spirit… especially when they have themed drink coasters! 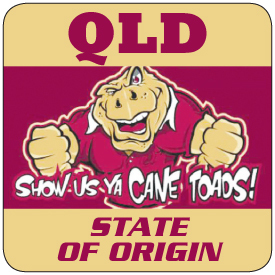 No matter where you live in Queensland or NSW, it’s easy to find supporters of either side. With our double-sided coasters – toads on one side, roaches on the other – everyone can show their true colours either way! If you’d like these fun coasters to compliment the attitude of your function, venue or State of Origin party, please contact us for more information or make an order directly through our website. While lots of lucky people will be seeing the games live in the ANZ Stadium and Suncorp Stadium, you can also bet that most establishments (and plenty of households) will have the match-ups screening on TV. If you’re a footy fan, there are limitless options as to how you can enjoy the game! While Promotional Drink Coasters has a popular selection of special date templates (such as the Melbourne Cup), we’re also well known for our ability to create coasters for niche events. 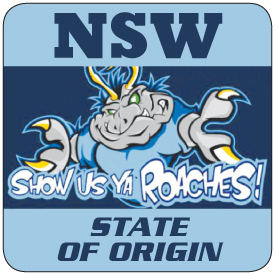 A great example of this is the coasters we print for the Riverina Classic. In this blog post, we’d like to shine a spotlight on this unique event and our involvement. In 2016, the Riverina Classic Fishing Competition is running from February 12th to February 14th and is supporting the Motor Neurone Disease Foundation of NSW. This will be the third Riverina Classic, after the great success of both the inaugural event in 2014 and the follow-up event in 2015. Last year, $18,000 was raised for the Prostate Cancer Foundation of Australia. The event includes a family fun weekend and is strictly a catch and release competition. As part of the event, a number of native fingerlings will be released into the Murrumbidgee River – this is a reflection of the Riverina Classic’s focus on sustainability in fishing. Our team played a significant role in the promotion of this year’s event by printing drink coasters using the artwork supplied by the client. In light of the valuable causes being supported by the Riverina Classic, we also felt it appropriate to offer a discount on our products. Promotional Drink Coasters has been a proud supplier of coasters for the Riverina Classic for the past 2 years. Please note that we are also able to assist with in-house coaster design if your business doesn’t already have artwork. We would love to effectively promote your upcoming event! From sporting legends to iconic landmarks, there’s a lot for our country to be proud of. If you’re lucky enough to have time off on Australia Day this year, here are some of the most fun (and most Aussie!) places to head to for a celebration of all things Oz. With the vast majority of our country’s population living within easy driving distance from the coast, it’s no wonder the beach is a classic place to congregate during the Aussie summer! Throw on your best togs, slap on some sunscreen and don’t forget the towels! Prepare some food in the morning so you can have a full day at the beach with a picnic lunch included. Many venues offer special meals or menus on Australia Day, so why not head to your local favourite for an Aussie lunch or a quick snack? You can’t go wrong by ordering roast lamb, pavlova or lamingtons. The best part is you don’t have to do any of the cooking yourself! 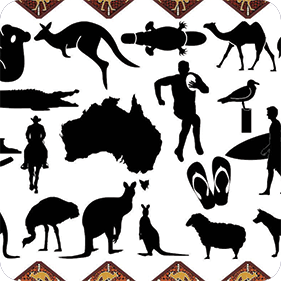 While you’re there, check the coasters – if they’ve got special Aussie Day designs, we might have printed them! Not in the mood to go out? No problem! The right backyard can be the perfect place for an Australia Day get-together. Heat up the BBQ, chill some drinks, get out the cricket set and invite your family, your friends and maybe even the neighbours. If the weather’s good, you’re sure to have a very Aussie blast in the backyard. Do you own a venue like a bar or a café? It might be too late to organise coasters for Australia Day, but there’s plenty of time to get in early for ANZAC Day! Click here to see our respectful remembrance coaster designs or contact us about creating a customised one for your establishment. We would be more than happy to post some sample drink coasters for you to look at. As with just about any business, the lead-up to Christmas is an extremely busy time for the team at Promotional Drink Coasters. There are many venues that want to boost their Christmas-cheer atmosphere through tailored coasters – one of them this year was the Taree Aquatic Club. Here’s a look at the coaster we made for them and the club that’s serving drinks on top of it. Christmas is all about good fun and festive cheer, so it was important for this coaster to reflect both of those things. The core colours are, of course, red and green, and the key image consists of the core Christmas icons: Santa, the tree, and presents. Needless to say, the font had to be fun too! In essence, we were able to create a coaster that blends with the Taree Aquatic Club’s image while embodying the spirit of Christmas – success! Know to locals as The Sailo’s, the Taree Aquatic Club is one of the most popular venues in the Manning Valley. Seated on the Manning River’s banks in Taree, the venue’s bar and dining areas give guests wonderful views of the river and surrounding countryside. The club hosts a number of aquatic-based activities for members and guests, including fishing, powerboat racing, and sailing. They also put on a spectacular fireworks show on New Year’s Eve – a much loved element of the Manning River Festival. You can read more about the aquatic club here or read more about the restaurant here. If the Taree Aquatic Club’s design has inspired you to create your own customised, festive coasters, please contact us today to get the ball rolling (and the ink flowing!). Christmas is a truly magical time of year – the jolly season certainly helps our designers come up with some enchanting imagery for our tailor-made coasters. A café is one of the most obvious types of businesses that can benefit from promotional drink coasters. These items provide the perfect platform for a hot cappuccino, a refreshing beer, or a frothy milkshake. And every time customers look down to pick up their beverage for a sip, the branded coaster reminds them exactly where they are enjoying their drink. These almost-subliminal reminders are excellent for encouraging repeat business and customer loyalty. Café d’bar, one of our favourite clients, is an establishment that takes advantage of this. With an attractive design and reliable material, the coasters we supply to Café d’bar help them create a consistent atmosphere and provide the ultimate relaxing experience for their patrons. dbar Coaster – WebOwners Donna and Steve Archdeacon are immensely proud of the modest part they’ve played in turning Coolangatta into one of Australia’s top tourist attractions. The area’s beautiful nature and chilled attitude provided the perfect location for these lovers of surfing, food and tourism to create their café – and live their dream. Delicious dishes, warm hospitality, and a stunning view of Duranbah Beach have made Café d’bar a highlight for many visitors to Coolangatta. With its former life as a standard fish’n’chips joint behind it, the building is now a delightful café and restaurant with an art gallery and gift shop. The love Steve and Donna have put into the establishment is evident throughout Café d’bar. With an ever-evolving menu, their own d’bar brand coffee, and the showcases of talented local artists in the gallery, Café d’bar is truly a treat for all your senses. The iconic place is much more than that though; it’s a space where you can enjoy a laidback and jovial experience that flawlessly embodies the essence of Coolangatta. Do you own a café, restaurant, bar, or any other establishment where drinks are served and good times are had? Contact us about our promotional drink coasters today so we can help your business in the same way we have assisted Café d’bar. As not everyone is always able to pop in and visit us here at Promotional Drink Coasters, we have been very busy in producing our very own video, to bring us to you – alternatively we can post sample drink coasters to you no problem. Please take a tour of our facilities and services that we can offer you or your customers.